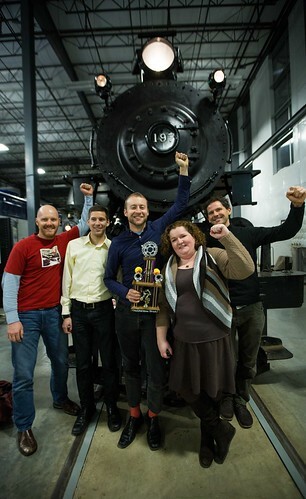 Our Transportation Trivia Night: BIG TRAINS EDITION fundraiser was incredibly successful. Together, we raised a grand total of $3,546 to support our work of broadening access to bicycling and its benefits. We can’t thank you enough for your generosity! For those of you who have been to one of our Transportation Trivia Nights, trust us when we say: this one was truly special. 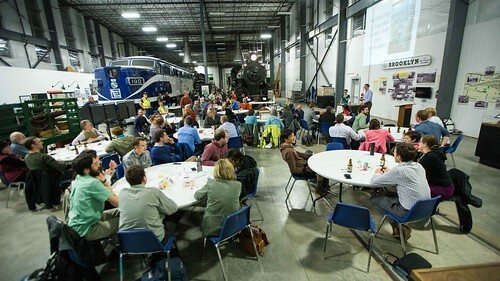 To be surrounded by giant trains at the Oregon Rail Heritage Center and the new Portland-Milwaukie light rail project just outside the doors, made the 3 rounds of challenging trivia that much more exciting. The questions this time were rail-intensive, however, we threw in quite a few walking, biking, and transit questions for good measure. We really can’t thank last night’s attendees enough for coming out to put their transportation knowledge to the test and support our work to create a healthier, more sustainable, and more equitable community. Congratulations to team Go By Locomotive! who were the grand prize winners of Transportation Trivia with 20 points. Team Baby Got Track came away with the Best Team Name prize. For those of you who were not able to attend (or would like to re-live the glory in your own homes), here are the Transportation Trivia slides from this edition. Make sure to save the date for the next round: August 12th, at Radio Room.